Opening shot of hero in the ordinary world. Last night on the train I saw a grown woman carrying a doll. She wore a black fedora with a few sparklies on it. 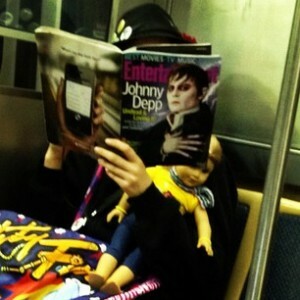 She was reading Entertainment Weekly with Johnny Depp on the cover. Across her lap was what first looked like a kite but turned out to be a huge plastic tote bag. In the crook of her arm was a doll, blank eyes staring out. The woman didn’t look crazy or even overly emotional. If this were a Johnny Depp movie she’d be the hero. She sat calmly, reading. Surreptitiously, feigning texting, I snapped a picture. I sent it to my friend Georgia, who wrote back that the picture reminded her of someone we used to work with, who’d been instructed by her therapist to carry a doll. “The doll came to work with her and spent the day in a crib under her desk.” This didn’t look like a therapy doll. It looked like a perfectly reasonable alternative to carrying a tiny dog or a baby. A comforting something in the crook of your arm, with no carbon footprint.